Corporate​ ​events,​ ​banquets,​ ​weddings,​ ​partays! Critically acclaimed Chef Leah Cohen and business partner Ben Byruch of Pig & Khao bring their signature style to Harborside with Piggyback Bar. Located steps from the Exchange Place Path, Piggyback Bar serves elevated traditional American bar fare fused with Asian flavors. 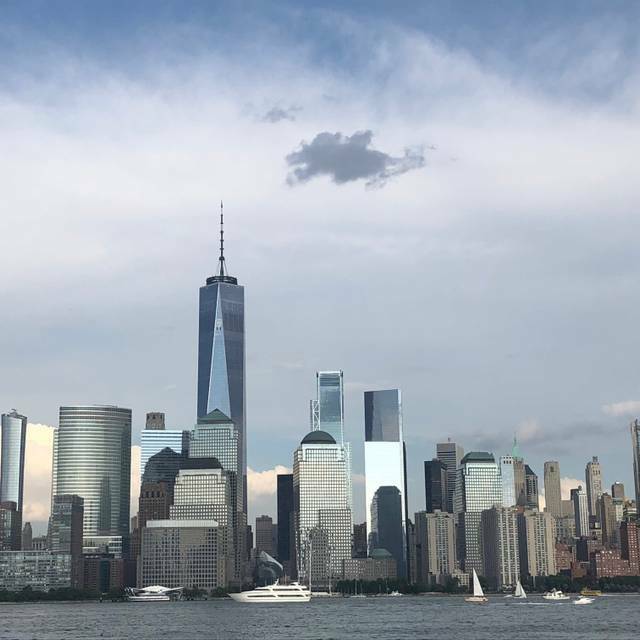 With stunning NYC views the restaurant offers brunch, lunch, dinner and happy hour menu with signature dishes including Mapo Chili Dog, crispy shallots, scallions; Korean Honey Butter Wings, gochujang, garlic, scallions and Mussels, Chinese sausage, dashi, fried mantao buns. The cocktail menu, developed by the team from Black Crescent, offers Asian-inspired cocktails, wine, and a selection of Asian and local beers. This is our third time to Piggyback Bar. This time the food was very salty (compared to same orders other times). The hot ciders were so-so and the setting was very noisy. We will not go back. My sisters and I go here a lot, but this last visit was an utter disappointment. I’m sure it’s a fluke and hope my next visit is amazing. We sat there 30 mins waiting for someone to even come back with our drinks. We came in for Brunch at 2pm and didn’t leave till 5. Not our normal experience. I hope I don’t have to cut it from my faves. Server could be friendlier, she seemed very angry from the beginning and unapproachable. 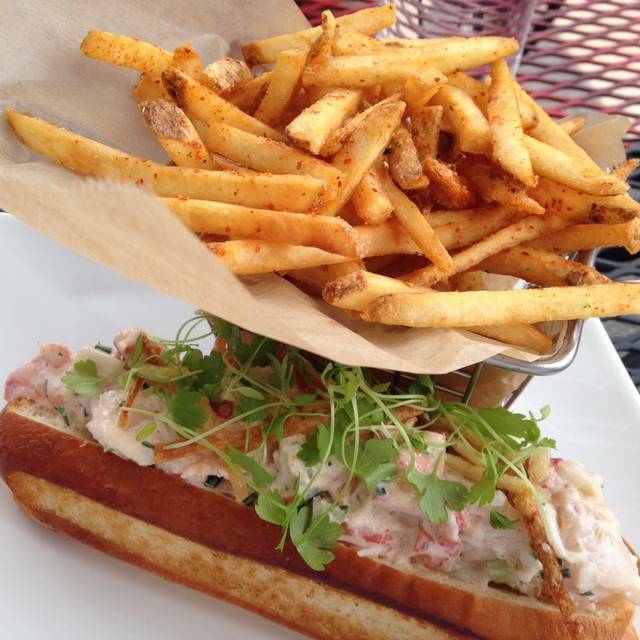 We have eaten at Piggyback Bar multiple times for lunch, happy hour and dinner as well. 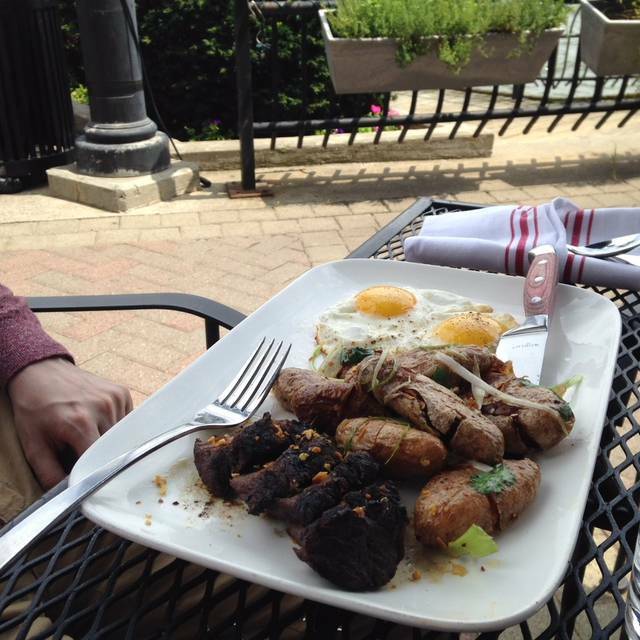 This was our first brunch experience at Piggyback and it did not disappoint! We had the onion petal appetizer as well as the honey butter wings(WE LOVE THESE! ), both were great! 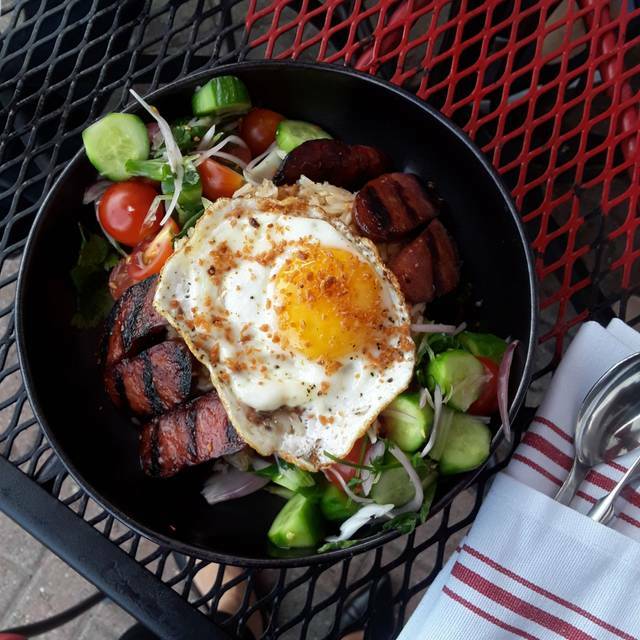 I had the longanisa bowl which was EXCELLENT, great blend of ingredients with the egg, cucumbers, crispy sausage and delicious rice! The only thing I did not like at all, was the Smokey Mary, their version of a Smokey Bloody Mary. It tasted watered down, almost no tomato juice and just was not appetizing. Service was good, we will definitely be back! Had a great time! Great meal!! The edamame was delicious. Staff was terrific. Did not like the fluorescent lighting. But view was nice. The edamame is the BEST. Everything we’ve had has been super delicious. 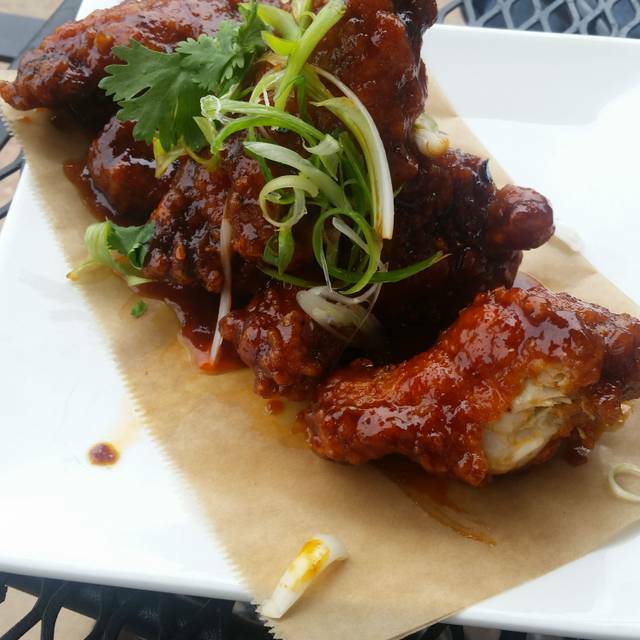 The sriracha wings are spicy- but sooo tasty! The happy hour menu is worth the trip. Only comment the music is too loud that makes it hard to talk, instead I feel like we are screaming to each other. 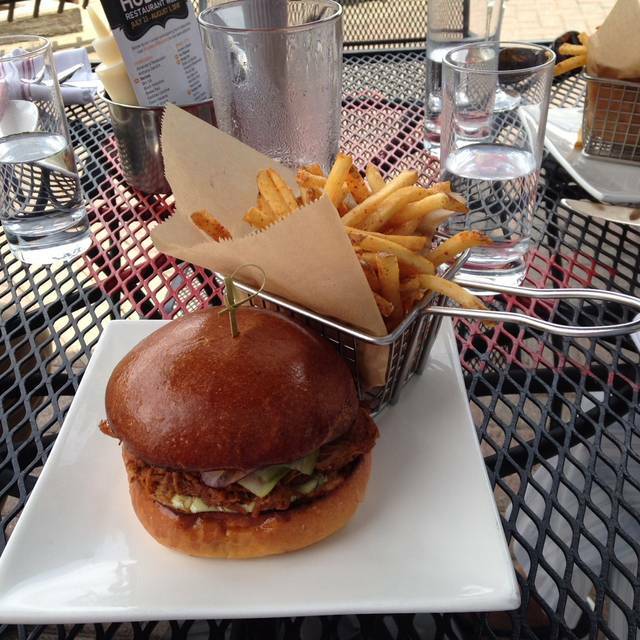 Great food, particularly the pulled pork sandwich and burger, and excellent value for a Restaurant Week special. The food was good and I enjoyed my meal up until the end. The tables are very close together and I accidentally bumped into the table next to me as I was trying to get by- just because it was tight, I hadn't been drinking. The table was empty but there were glasses on it and I accidentally knocked over a glass and it broke. I apologized to the waitress but she wasn't having it at all. She was very annoyed at me and looked like I had ruined her whole night. I was really sorry and I did apologize, but accidents happen. It seemed like overkill to me for a waitress to be that upset at me over one broken glass. Disco phories are worth the trip alone! Everything we had was delicious I will definitely be visiting again! We saw this place from Fios Cable channel and seems interesting to check out. The View and Restaurant were nice. Food is so so. I ordered their ribs, which I find a little bitter and salty, My friends ordered the Burgers and Lobster Sandwich, which is okay, but nothing spectacular about it. Grain Salad was good and the Salt and Pepper Shrimp appetizer were also good. The Fries comes with the burgers was also good. We may consider coming back just because of the place. Excellent Location. Really enjoy the place, the food is excellent. Great spot for groups! Amazing food and awesome service. Happy hour is a great value. The mussels could use a little bit more wine. First time diner, enjoyed the view and the company. The steak buns look delicious, my black bass was good. The garnish doesn’t accommodate the fish very well though. This was our first time there and we went the Friday after Thanksgiving for dinner. It was fairly quiet and I don't know if that's normal for a Friday night (this is a business district) or because it was the Friday after Thanksgiving and a lot of people were still out of town. That was fine with us however. My only complaint was the hostess initially tried to sit us at a table that had no views of the NYC skyline as the table was in front of a large brick wall. When I asked for a table with a view she sort of rolled her eyes and then sat us in the back by the service station. Given how quiet it was I don't think my request was a big deal. You should be happy for the diners you get. The rest of the wait staff were very accommodating and the food was nicely prepared. We had a great time. The drinks were great and the brunch items were fun and unique! My boyfriend and I thoroughly enjoyed our brunch this past weekend! 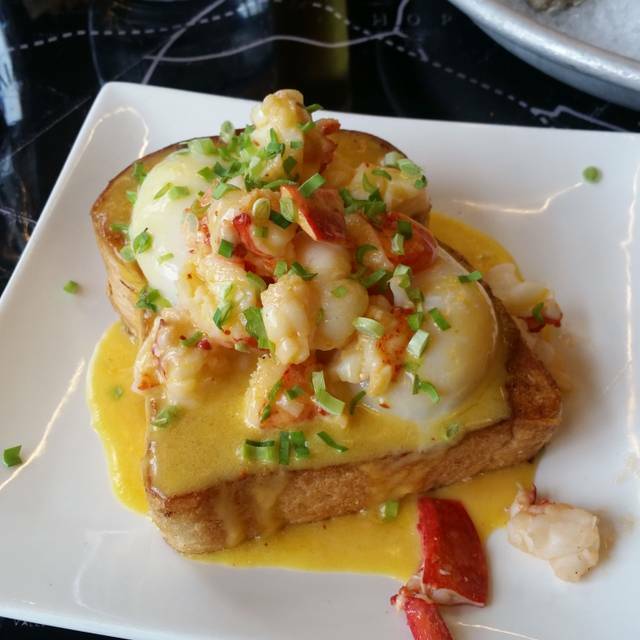 I went with the french toast...get this as you will not be disappointed. Look forward to our next trip there. Our waitress Karleigh was Exceptionally Wonderful! The menu isn’t very large, but there’s more than enough to choose from. I had the scallion pancakes as an appetizer. Definitely enough to share. I also had the scallops in green curry for dinner. Everything was very delicious. Nothing was too spicy. Just the right amount of heat. The view is amazing. 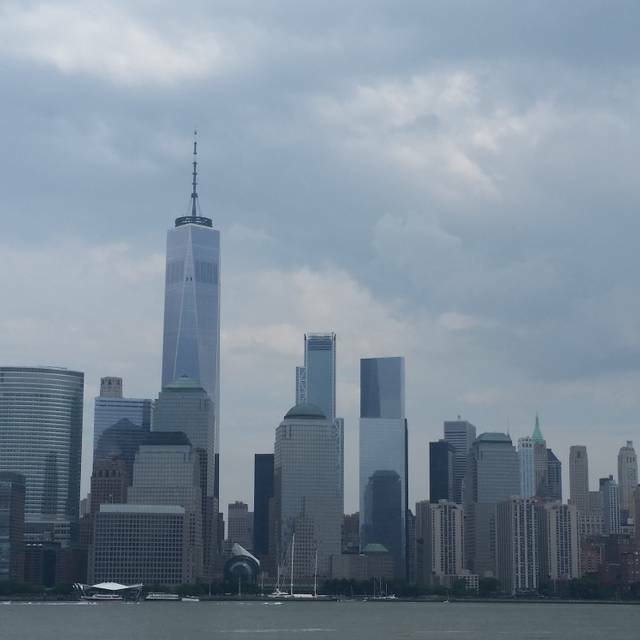 Right across from lower Manhattan. I would highly recommend Piggyback. NEW FAVORITE SPOT, SO GLAD I FOUND IT. MY DATE LOVED IT. GOT ME LAID. This was our second visit. The view of NYC is beautiful, especially at night. Their burger is delicious and the fries have a nice kick. Also loved the grain salad with chicken. The fried calamari was disappointing- small portion and rubbery. Peach crisp with ice cream was a nice warm, not too sweet end to the meal. Good cocktails. Definitely wood return. Meeting my girlfriends for Brunch at this place was a good idea. It was a perfect Saturday and the view was amazing. We were seated outside and our orders was taken immediately. The food came pretty fast, enjoyed everything except that the sausage (longganisa) was a bit on the salty side and my girlfriend's steak is well done when she asked for medium rare. But overall, we enjoyed the ambiance and the view. Will definitely come back. The food was outstanding, the drinks were really good and not watered down. I had the desperate housewife which was soo tasty. There was a server named Anthony who had to be the best that's ever done it. He recommended items from the menu and drinks and he was attentive without hovering. He gave world class customer service. He's a keeper. The food was very salty and the service was poor. The drinks were very good. We ordered phories and those were salty. The chicken wings and the fried chicken sandwich were very good. The baby back ribs were also very salty. Cute, fun and delicious. It’s somewhere I would go every Friday for a laid back night out. The food at Piggyback is fine. The grain salad is great and the lobster roll was passable. Nothing special honestly. The noise level is awful and the music vacillated between loud and obscenely loud - to the point that we could not speak without yelling. Even after asking to move to a quieter area we were seated literally 3 yards away from the giant bar area, at a table next to the kitchen. This was odd especially since there is an entire section around the back that is significantly quieter. Our waitress was not friendly but I wouldn’t say she was rude either. She just seemed rather bored, kind of annoyed and pushy. She asked at least three times if we were ready to order even after we told her that myself and my dining companion hadn’t seen each other for a long time and would like to catch up over the bar snack and drinks we had already ordered. And it wasn’t like the restaurant was packed and people were waiting - at no point was the place overly busy and there were open tables at all times. The wait time for food was perfectly reasonable and my friend loved her fried chicken sandwhich. I do not recommend either the lobster roll or the onion petals. I would highly reccomend the grain salad though. It was light and tasty. I will say that the Thai chili margarita was very good and I probably enjoyed that most of all. The setting isn’t comfortable - the chairs are metal and have no softness or cushion so sitting for more than an hour is very uncomfy which is a shame. I understand this is a bar/bbq/casual place but I feel like comfortable chairs are a must have for any restaurant. Needless to say I wouldn’t go back voluntarily to Piggyback but I would go for a happy hour even for drinks and bar snacks. I've eaten here a couple of times for dinner and it's been fine-to-pretty darn good. I brought my family for brunch this weekend and was really disappointed. Service was indifferent. I asked for my eggs to be 'not runny' to be informed that they do not cook eggs to temperature request; all eggs will be over easy, but they will ask the chef. Okay, I said, that'll work. Well, I guess the request annoyed the chef, because my eggs were not even 'over easy', but just plain raw. The whites were not cooked; it was disgusting. Oddly enough, my partner (who likes runny eggs) received eggs that were cooked to the point where they were not runny (which would have been good for me). My guest's 'medium' burger was well-done. The disco phories were very very very salty. Our dishes were not brought out together and by the time the last dishes were delivered, the rest of the food was cold. I was embarrassed to bring my family there. Very unhappy. Very limited menu. Everything was too spicy. No real options for non spicy food. Not a great menu. You leave without your tastebuds. Second time to Piggyback Bar, this time for brunch. I booked on Open Table and asked the receptionist that we preferred a table outside. She was kind enough to reserve a table for us on the patio. Ordered some drinks and the steak and eggs, lobster roll and the kimchi pulled pork sandwiches (last two came with spicy fries - addicting!) For desert we shared a "Flux Capacitator" cocktail. The food was very good, highly recommend this place. We will definitely be back to try some more! I chose this restaurant based on an online list of recommendations in Jersey City. However, I was unfortunately disappointed. It's located in the ground floor of a large building, and lacks any sort of coziness. There were a couple of dishes not on the menu which were on the website menu. There was nothing of distinction that made me think it should be on anyone's 'recommended list'. The view is of course great, if you are facing it from your table - but it would be better to eat elsewhere and walk along the water afterwards. 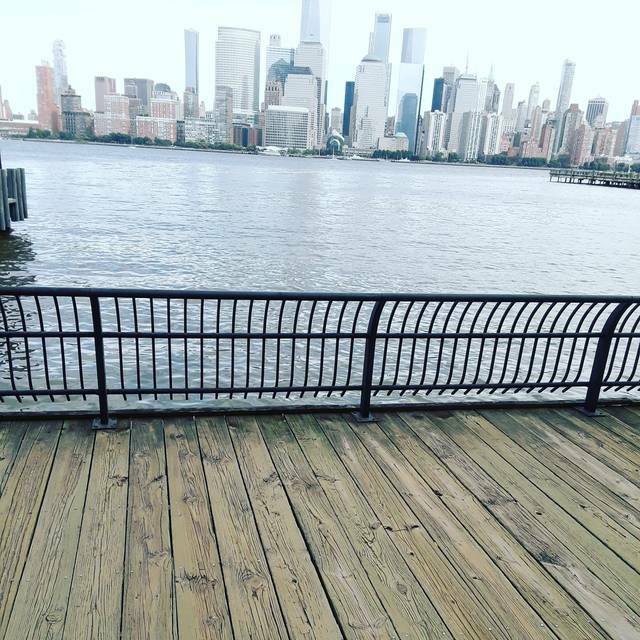 Great food with a spectacular NYC view! Will be back again, and it will be one of my favorite places when my family and I are in downtown. Took my wife and 4.5 month old out for date night. Made a reservation ahead of time that saved us a moderate wait and got a table outside with a view of the city. It was a perfect night. Staff is super attentive and food is amazing. Inside was a noisy happy hour crew with finance bros but outsiders sublime. Food was ok. Hanger steak has no flavor unfortunately. But it was edible. Short ribs were a bit hard. And our server was great in service but a smile or friendly you're welcome wouldn't have hurt. Otherwise all was good. Great drinks and food. Mike is great.